"To a beautiful princess who's seven." With this simple six-word phrase, a battle royale started. My oldest brother, Brent, struck first when, for my 14th birthday, he lobbed the above card at me. Now, as a 14-year-old boy, I was not a girl, nor had I recently turned seven. Well played Brent, well played. But little did he know, the arms race had started. Over the next 12 years, my whole family has engaged in this battle. We use cards subtly modified to make a bizarre meaning or cards that are bizarre in-and-of themselves to odd up and make any birthdays, mother's days, arbor's days, talk like a pirate days and halloweens as bizarre as possible. Our weapons are weirdness, specifically related to birthday/holiday cards. Throughout the years, there have been hits and misses, but mainly there have been bizarre memories. A brief recap of some of the more memorable ones. For Brent's birthday one year, I found something like a “Congratulations on becoming a Rabbi day!” Now in some circles, this card probably holds great sway. For a gentile family with little chance of anyone passing the final rabbinical tests (that is, if there is a test), this card is just amazing. Brent sent my middle brother, Eric, a “birthday” “card” by fishing a used piece of paper from the copy room at work. He wrote “Birthday! - Brent” on the inside, folded the sheet over, crossed out the copy room garbage and wrote Eric's address on it. He attached a stamp and dropped it in the mail, not entirely certain it would get to its destination. Somehow it did. For one of the bestest brother-in-lifes ever! My Grandma even got involved in the act when she sent me a card that had cut out Muppet Baby puppets for my 22nd birthday. In and of itself, that card was awesome. From my Grandma, it reached a whole new level of amazing. Especially for a 22-year-old. Over the years, I've developed a card-modifying philosophy that rarely lets me down. First off, the more original copy left, the better. I aim for roughly 50-75 percent of the original copy. The rest gets crossed out for comical effect or wholly rewritten. For example, strategically placing a “3” on an Elmo birthday card for a 2-year-old becomes a great Elmo birthday card for 23-year-old Eric. Generally inserting things where they don't belong makes for better cards. Your mom might have told you to never do that, but she wouldn't have had to if you had simply modified the card. One of the best cards I've ever sent went out to Brent. It was intended to be from a dad to his daughter and basically acted as a “Cats in the Cradle” setup, letting her know how proud the father felt. Touching and endearing, tear-worthy and happy are the only ways to describe this card. However, when the “daughter” is changed to an “older brother,” things become weird. When it talks about taking him to the bus stop on the very first day of school (and he waved at me! ), it's creepy. When I talk about him sitting on my lap and making me smile, it's borderline incestuous (although, I suppose that subtext existed in the original). Even better, I actually forgot to sign that card. This prompted Brent to say “It was really weird to start, and then, it just ended. And that made it even weirder.” Unintended success! One thing to remember, the “Humor” cards never work for modification purposes. Not only are they not funny in their own right, but the images associated with it are hard to separate from their copy. Although it's unfunny copy, it's the only type that works with image of a man wearing cut off jeans and a stupid hat. 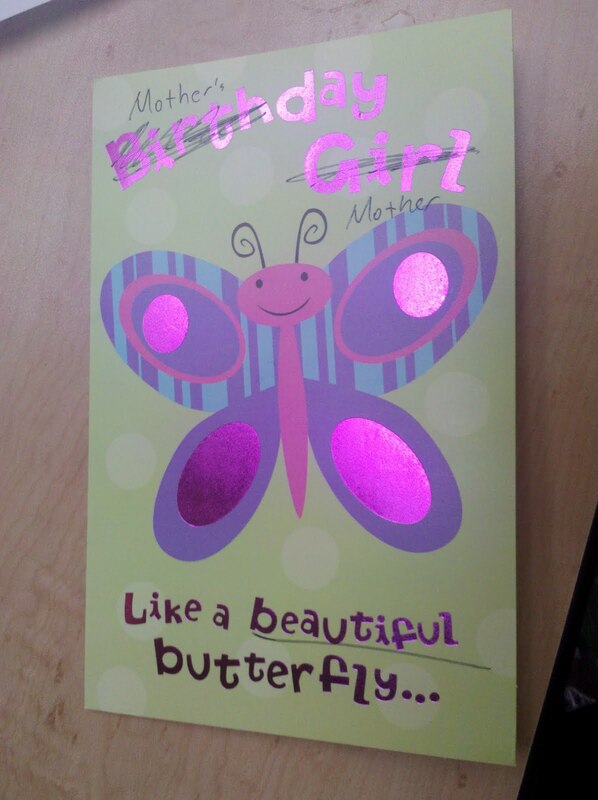 Until they start making a “Mother's Birthday Girl Mother,” card, just like that with “Birth” and “Girl” crossed out, I have no need to delve into the humor cards. And even if I did, I'd change the “Mother's day Mother” card to be something else. Recently, I purchased my mom a normal birthday card for her birthday, she didn't know how to react. “I was expecting something strange, but this was just... it was just a normal birthday card.” She expected references to space ninjas or gigantic cards sent postage due with a 20-inch tall Dora the Explorer (which I did send a couple years ago). Instead, she got a card. This confused her. Card success. With all this said, it was my dad's birthday yesterday. I found a card for a “Sweet Princess.” It became one for a “Sweet Birthday Dad” and sent his way. Weird on its own right, even weirder with the callback to a card my brother sent me 14 years ago. My birthday is next in the family. Bring it on, I'm expecting some good ones this September.